Do You Know Your Bruins Trivia? Are you a die-hard Boston Bruins fan? Think you know all there is to know about the team? Let’s find out. We’ve dug into the past to pull out some key moments by some of the great players and coaches in the franchise’s history. How Well Do You Know the Bruins’ History? What year was the Bruins franchise founded? The Boston Bruins were founded on Nov. 1, 1924, as the first American franchise and the third member of the NHL’s Original Six, after the Montreal Canadiens and Toronto Maple Leafs. What was special about the Bruins’ record from 1970-74? This Bruins had four consecutive seasons with more than 50 wins–57, 54, 51 and 52, respectively. What Bruins player missed an open-net goal in a 1990 playoff game against the Edmonton Oilers by backhanding the puck over the net? Glen Wesley missed a wide open net in the closing seconds of the game, which went into overtime. Which team did the Bruins defeat in the 1970 Stanley Cup Final series? The Bruins defeated the Western Conference champion St. Louis Blues in a four-game sweep, winning their first Stanley Cup title in 29 years. An indelible image of the victory was Bobby Orr’s Cup-clinching goal; he went flying through the air after beating goalie Glenn Hall in overtime. What player ripped off a fan’s shoe and beat him with it in a brawl with fans in New York? It was none other than Mike Milbury in a scene straight out of Slap Shot. On Dec. 23, 1979, the end of the Bruins-Rangers game featured a brawl and, as the fighting subsided, a fan reached over the glass behind the Bruins’ bench to steal Stan Jonathan’s stick. When the fan resisted Jonathan’s attempt to reclaim his stick, O’Reilly led the charge into the seats. Milbury, though, stole the show by clobbering one of the fans over the head with the fan’s shoe. 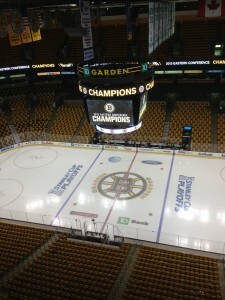 Where did the Bruins play once they left the Boston Garden in 1995? The Bruins moved from the Boston Garden to the TD Garden, going from a facility with 14,448 official seats to one with room for 17,565. The Bruins played at the Boston Arena (capacity 5,900) from 1924-1927. Which two players did the Bruins acquire at the 2004 NHL trade deadline? The Bruins acquired both Sergei Gonchar and Michael Nylander for picks and Shaone Morrison. How many times did the Bruins lose in the Stanley Cup Final in the twentieth century? The Bruins and their fans suffered Stanley Cup Final losses 12 times: to Ottawa in 1926-27; to Montreal in 1929-30, 1945-46, 1952-53, 1956-57, 1957-58, 1976-77, and 1977-78; to Detroit in 1942-43; to Philadelphia in 1973-74; and to Edmonton in 1987-88 and 1989-90. What hockey player is known as the ‘Chief’? Imlach is no longer interested in Johnny Bucyk. 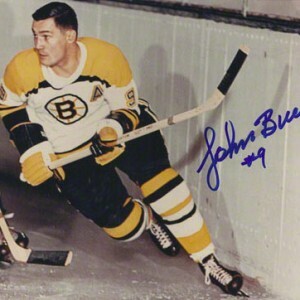 Hockey Hall-of-Famer Johnny Bucyk was known as the ‘Chief.’ He was captain of the Bruins from 1969-1972 and one of the greatest players in Bruins history. He wore the No. 9 jersey with class and pride, playing left wing on a line with Fred Stanfield and John McKenzie. Bucyk scored 124 goals and had 154 assists from 1969 to 1972, including 51 goals during the 1970-71 season. He ended his NHL career with 556 regular season tallies. Ted Green and Don Awrey both played defense for the Big Bad Bruins. On Oct. 27, 2007, against the Flyers, what player hit Patrice Bergeron from behind, eventually ending his season? The game was delayed for 15 minutes after Randy Jones’ vicious hit from behind on Bergeron. Jones was given a boarding call and a game misconduct, and was later suspended. Who was the first player to get a life-long suspension? Billy Coutu of the Bruins was suspended for life. After losing a game in the 1927 Stanley Cup playoffs, he brutally assaulted a referee. 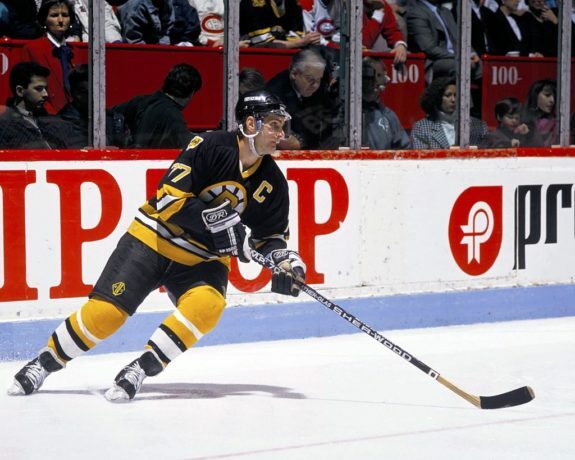 When and why did Ray Bourque change his jersey number from 7 to 77? Bourque made the change on Dec. 3, 1987, out of respect for Phil Esposito. 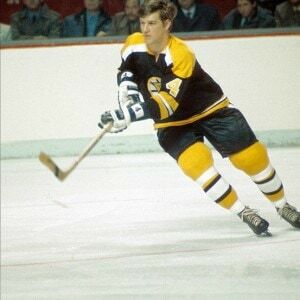 Esposito, a prolific goal scorer for the Bruins between 1967 and 1975, had his No. 7 officially retired in during an emotional ceremony at Boston Garden. Which Bruin set an NHL record for the quickest two goals to start a game? Mike Knuble scored two goals 27 seconds into a game vs. the Florida Panthers in 2003. The feat is an NHL record for the two fastest goals to start a game in NHL history. Which Bruin led the team in goals with 55 in the 1972-73 season? Phil Esposito potted 55 goals. Bucyk had 40, Ken Hodge had 37, and Bobby Orr had 29, leading all NHL defensemen. Who was the coach of the 1972 Stanley Cup champion Bruins? Tom Johnson played for the Habs before joining the Bruins. An injury forced his retirement. Tom Johnson, a Hall-of-Fame defenseman for Montreal, took over as coach of the Bruins during the 1970-71 season and led the Bruins to the Stanley Cup title in the 1971-72 campaign. Harry Sinden coached the Bruins to the 1970 Stanley Cup. Who led the team in penalty minutes for the 1972-73 regular season? Carol Vadnais led Bruins with 127 penalty minutes. Wayne Cashman had 100 penalty minutes, and Dallas Smith had 72. How many times did the Bruins win the Stanley Cup in the 20th century? They won five times in 17 appearances. Who scored the first Bruins hat trick in Montreal since 1959 on Dec. 4, 1982? Barry Pederson lit the lamp three times for the Bruins. He was also part of one of the biggest trades in Bruins history. He was dealt to Vancouver for Cam Neely and a pick that turned out to be Glen Wesley. The Bruins were the first NHL team to break the color barrier by skating a black player. Who was he? 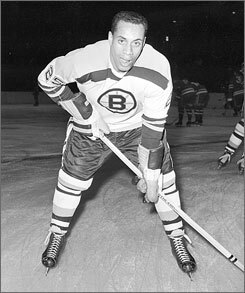 On Jan. 18, 1958, Willie O’Ree took the ice for the Bruins against the Montreal Canadians. Although his NHL career was brief (he played in two games for the Bruins in 1957-58 and 43 in 1960-61), O’Ree played some 22 seasons of pro hockey from 1957-1979, mostly in the Western Hockey League. He played with 95 percent loss of sight in his right eye, something he kept hidden. What was Cecil Thompson’s nickname? 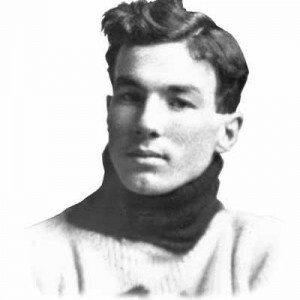 Cecil ‘Tiny’ Thompson was the Bruins’ star goalie from 1928-1938. Which Bruins center led the team in points and assists in the 2008-09 season? Marc Savard ended the year with 25 goals and 63 assists, good for 88 points. Perhaps most impressively, he ended the season with a plus/minus of plus-25, notable due to his reputation as an irresponsible player in his defensive end. 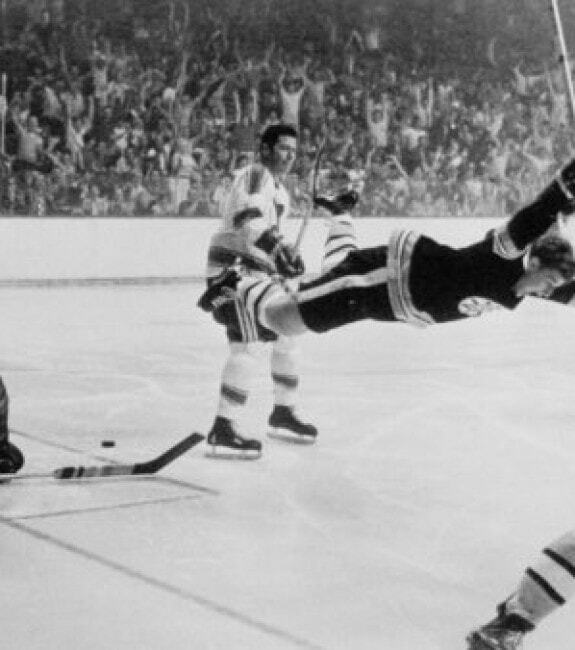 Who made the pass to Bobby Orr in 1970 before he scored and flew through the air? Derek Sanderson made the pass to set up Bobby Orr’s famous flying-through-the-air goal that won the 1970 Cup against the St. Louis Blues. He later did color commentary for the B’s for a few years. Winning the Stanley Cup against St. Louis. What was the margin of the Bruins’ most lopsided victory in team history, that was accomplished 3 times? The Bruins have won by 11 goals three times in the team’s history. Who was known as ‘Nifty’? Rick Middleton was known as ‘Nifty.’ He scored a career high 51 goals in the 1981-82 season. Which Bruins have reached the 50-goal mark in three seasons? 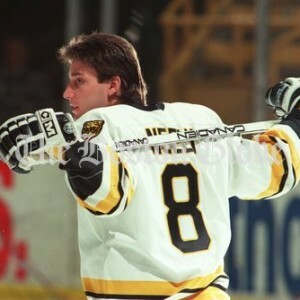 Cam Neely hit the mark three times. He scored 55 goals in 1989-90, 51 goals in 1990-91 and 50 goals in 1993-94. Phil Esposito reached 50 goals a remarkable five times. He scored 76 goals in 1970-71, 66 goals in 1971-72, 55 goals in 1972-73, 68 goals in 1973-74, and 61 goals in 1974-75. During the twentieth century, which seven goalies who played for the Bruins were inducted in to the NHL Hall of Fame? Jacques Plante, a top goalie for the Montreal Canadians, played for the Bruins only in 1973. He was inducted into the Hall Of Fame in 1978. Tiny Thompson was the Bruins goalie from 1928-1938. He joined the Hall Of Fame in 1959. Frank Brimsek followed Thompson in goal for the Bruins, playing from 1938-1949 and joining the Hall Of Fame in 1966. Gerry Cheevers played for the Bruins from 1965-1972 and 1976-1980. He became a Hall-of-Fame member in 1985. Terry Sawchuk, primarily a Red Wings goalie, was with the Bruins 1955-1957 and entered the Hall in 1971. Harry Lumley, a top Maple Leafs goalie, played in Boston 1from 957-1960 and was enshrined in 1980. Bernie Parent, mainly a Flyers goalie, was a Bruin from 1965-1967 and made the Hall of Fame in 1984. In the 1970s, a bumper sticker in Boston said, “Jesus Saves, ________ scores on the rebound”? Phil Esposito. More than half of his goals were scored on rebounds. Who was responsible for the original injury that led to the end of Neely’s career? Ulf Samuelsson plowed through Neely in Game 3 of the 1991 Conference Final. Which Bruin star was the first to score 1,500 points? Bourque (1979-2000) scored 1,506 points. Johnny Bucyk (1957-78) was second with 1,339 points. Phil Esposito (1967-76) was third with 1,012. In Game 6 of the 2008 first round against the Montreal Canadiens, which was one of the most thrilling playoff games for the Bruins in recent memory, which player scored what was eventually the game-winner in the wild third period? After his original shot was blocked, Marco Sturm gathered his own rebound, skated right in front of net, waited patiently for goaltender Carey Price to commit, and shot the puck into the open net for an exhilaratingly wild 5-4 Bruins win. In what year did the Bruins set a team record for goals, scoring 399 goals? The offensively gifted team of 1970-71 scored 399 goals. What was the nickname of the Bruins’ top line featuring Joe Thornton, Glen Murray, and Mike Knuble? The ‘700 Pound line’ was named by Canadiens coach Claude Julien after a dominant game by the line. In what game of the 1988 Final vs. the Oilers did the lights of the Garden go out? Game 4. The game was suspended, then resumed in Edmonton two days later. 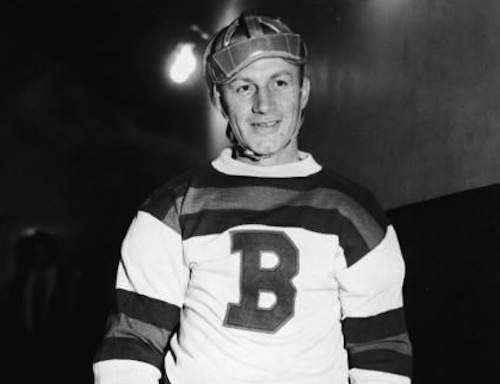 The Bruins had four men elected to the NHL Hall of Fame in the twentieth century in the category ‘Builders.’ Which of those four was the only one to coach the Bruins? Art Ross. He was the first coach of the Bruins in 1924. He served as head coach and later general manager from 1924-1954. The NHL Art Ross Trophy for the leading point scorer bears his name. Charles Adams, President from 1924-1936, joined the Hall of Fame in 1960. Weston Adams, President from 1936-1951, was inducted in 1972. Walter Brown, President from 1951-1964, was enshrined in 1962. The 2008-09 Bruins allowed the fewest goals of any team in the NHL. How many did they let in? The William M. Jennings Trophy went to the Bruins as they gave up a league-low 196 goals over the season. 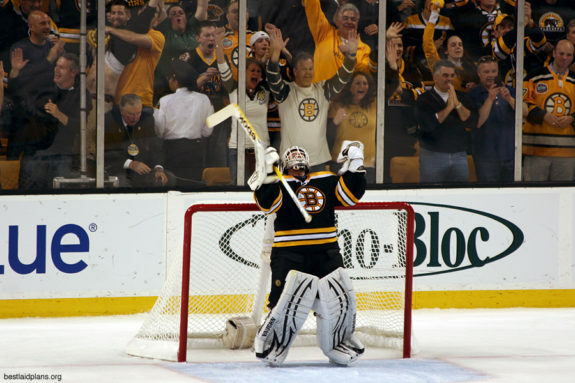 Bruins goalies Tim Thomas and Manny Fernandez were stellar all season. Hot prospect Tuukka Rask got a shutout against the New York Rangers in his only start of the season. Thomas was awarded the Vezina Trophy as best goaltender in 2008-09. In the Eddie Shore-Ace Bailey incident on Dec. 12, 1933, how long was Eddie Shore suspended? Shore was suspended 16 games. After he was tripped up on a breakaway and did not get a penalty called, Eddie Shore took out his anger on Ace Bailey. After laying a devastating hit on Bailey, Maple Leafs captain Red Horner rushed at Shore. Not realizing how much damage was done, Shore smiled at Horner as if to say “give me your best shot.” After absorbing Horner’s punch, Shore lay motionless on the ice. Bailey was put in the hospital and hovered close to death and was operated on twice to relieve pressure in his skull. He recovered but never played hockey again. Who was the first Bruin to be awarded a penalty shot in the playoffs? Peter McNab. The penalty shot was unsuccessful and occurred in 1981. 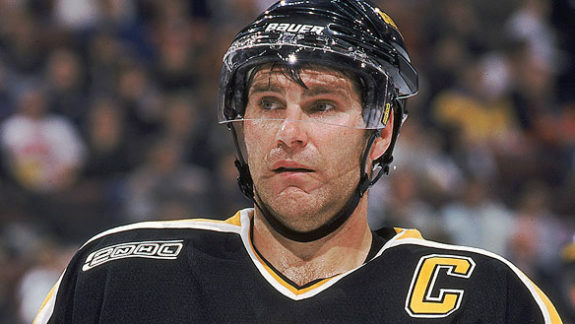 Which Bruins player served as team captain from 1988 to 2000? Who struck Donald Brashear in the head in a contentious 2000 Canucks-Bruins game? Marty McSorley claimed it was an unfortunate accident. Regardless, it was ugly. Brashear dropped like a ton of bricks. McSorley received a $72,000 fine and was suspended for the final 23 games of the season. He never played another game in the NHL. What team beat the Bruins in the 1990 Stanley Cup Final? The Edmonton Oilers got by the Bruins, four games to one. How many games did it take for the Bruins to get by the Vancouver Canucks to win the 2011 Stanley Cup? The series went the limit–seven games. The Bruins won final game, 4-0. Which Bruin won the 2011 Conn Smythe Award? Tim Thomas was the MVP. Tim Thomas was a brick wall for the Bruins. (Photo by Chassen Ikiri). Who was Bruins owner Charles Adams’ first hire that became the face of the franchise for the first few decades? After being granted the franchise in 1924, one of the first moves Bruins owner Charles Adams made was to hire Art Ross, a former star player and innovator, as general manager. Ross would be the face of the franchise for 30 years, including four separate stints as coach. 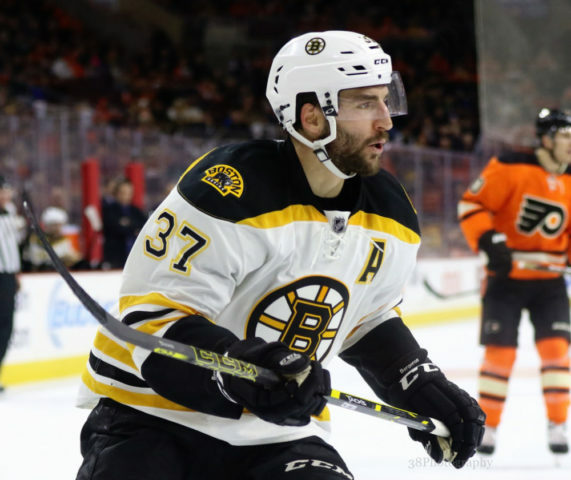 How did defenseman Eddie Shore become a Bruin? In 1926-27, Art Ross took advantage of the collapse of the Western Hockey League to purchase several western stars, including the team’s first superstar, defenseman Eddie Shore. What year did the spoked-B logo first appear? 1948-49 was the first season that the well0recognized spoked B-logo appeared on the Bruins’ jerseys. Who led the Bruins in points during the regular season in 2002-03? Joe Thornton had 101 points. It was the first time a Bruins player reached the 100-point mark since Adam Oates did it in 1992. Thornton had a career-best year in 2005-06 with the Bruins and San Jose Sharks following his trade there. The first player to break the 100-point mark in a single season was Phil Esposito, who centered a line with Ken Hodge and Wayne Cashman in 1969.
Who was the first Bruins goalie to record 40 wins in a season? Pete Peeters had 40 wins in the 1982-83 season. In what season did the Bruins win their first Stanley Cup? In 1929, the Bruins defeated the New York Rangers two games to none in a best-of-three final. What player is the only one in NHL history to win the Norris, Art Ross, Conn Smythe and Hart Trophies in the same season? Bobby Orr’s 1969-70 season was one for the ages. He won the third of eight straight Norris Memorial Trophies as the top defenseman in the NHL. He also took home the Art Ross Trophy, Conn Smythe Trophy, and the Hart Memorial Trophy, becoming the only player to win all four awards all in the same season. 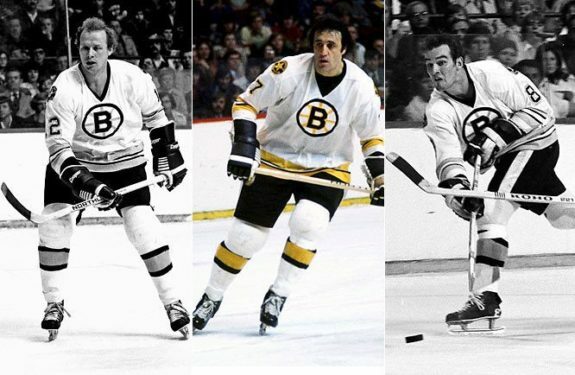 In the 1970-71 season, who were the seven Bruins that amazingly comprised seven of the league’s top 10 scorers? The 1970-71 season was a banner year for the Bruins, setting dozens of offensive scoring records. 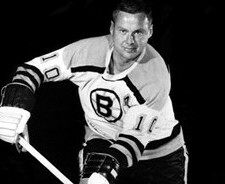 They had seven of the league’s top 10 scorers (a feat not achieved before or since), set the record for wins in a season, and in a league that had never seen a 100-plus point scorer before 1969, they had four that year (Orr, Esposito, Bucyk and Hodge). When did the Bruins move into TD Bank Garden? The Bruins moved into their new home arena in 1995 after leaving the Boston Garden, which had been their home since 1928. Did you get a few right? Did you know more than you thought? Regardless, we hope you had some fun and learned a few things along the way. This is just one installment of Original Six trivia. Be sure to check out the Rangers, Maple Leafs, Blackhawks, Red Wings and Canadiens versions as well.